New, revised, updated edition 2018. Lyn Kelley, Ph.D., CPC is a Certified Professional Coach who has been providing seminars, CE courses and consulting for thousands of healthcare providers for over 25 years. She gives you the tried-true-tested PROVEN methods to promote your practice to a well-pay clientele, in the most cost-effective ways. No frill, no fluff, just the facts! All medical and healthcare providers need to read this book! Practice Angels are your best referral sources. 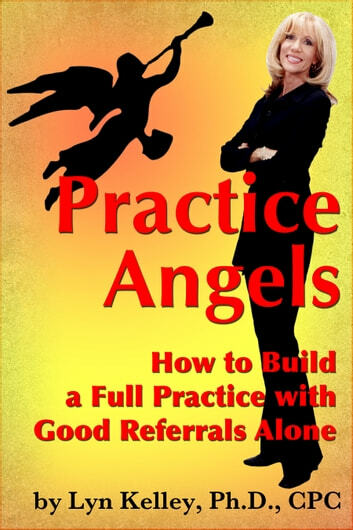 You can build your entire practice with well-pay, self-pay clients simply with a few good referral sources. Dr. Kelley gives you the most ethical and effective ways to find your best referral sources and cause them to refer to you over and over. Bonus: 7 ways to double your income without advertising or spending any money!